Mister Rogers looks at a few toy cars, including a school bus, used in the opening shots of the Neighborhood program. Taking them to the kitchen, he shows a model house and school. As he shows these models, he talks about going to school and tells viewers that each time you go to school, you have the chance to discover something new. After checking in with a local kindergarten teacher, Mrs. Hartman, Mister Rogers takes viewers with him as he visits her classroom. Mrs. Hartman walks Mister Rogers through daily school activies and shows him around her school building. Returning to the house, Mister Rogers transforms the Trolley into a pretend school bus before sending it off to the Neighborhood of Make-Believe. In the Neighborhood of Make-Believe, the Trolley's school bus costume brings inspiration for a Neighborhood school. King Friday commissions Lady Aberlin and Handyman Negri to build a school -- in three days. Setting out to interview everyone in the Neighborhood about the best location for the new school, Lady Aberlin begins at the factory where Corney suggests that the school could be a the factory. Unfortunately, there is not enough room there for a playground. At the Museum-Go-Round, Handyman Negri has a similar concern with Lady Elaine's offer to have the school on her property. Dr. Bill Platypus suggests that the school be located somewhere that the children can "go off to school" while Daniel Striped Tiger mentions the need for lots of space. Meanwhile, X the Owl and Henrietta Pussycat are eager to find out where the school will be. At Someplace Else, Harriett Elizabeth Cow and Donkey Hodie are already thinking about a school at Someplace Else when Lady Aberlin and Handyman Negri arrive with the news of their commission. They return to the castle where they report to King Friday that the school will be located at Someplace Else. 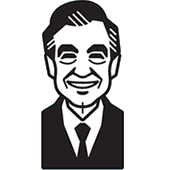 Back at the house, Mister Rogers talks about all people being unique. The school visited by Mister Rogers is the McKee Elementary School in Oakdale, PA. If you visit the McKee Elementary website, you will see that the school looks much the same (from the outside, at least) almost 30 years later. Queen Sara mentions her memories of going to school in Westwood. As Lady Elaine describes her Museum-Go-Round as a possible location for the school, the first few words she uses are from her song Museum Wares. This episode is included on the Mister Rogers Goes To School video disc. When Mister Rogers walks into the school, he opens the heavy door and it inexplicably stays open through the remainder of the shot. 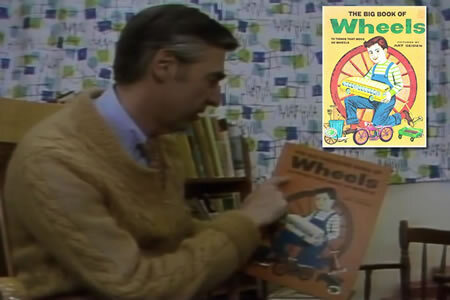 The book Mister Rogers picks up in the classroom is The Big Book of Wheels which can be purchased on Amazon. 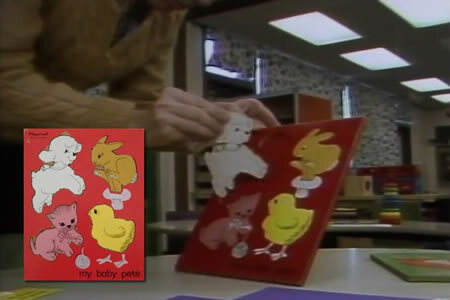 The puzzle Mister Rogers plays with in the classroom is a Playskool puzzle titled "My Baby Pets."